I started this feature in November 2006 - Sixty-five years after the cover date of the comic that carried the first Aquaman story in November 1941. After rescuing a man thrown overboard a gambling ship, Aquaman goes undercover to learn the secret of the ship. Another Black Jack story, and Black Jack's first disguise. He has another ship and dresses up as the Rajah of Joon. Aquaman's suspicion is aroused when he learns of the Rajah, as he tells the man he rescued, "I've traveled much, but never heard of the country of Joon!" 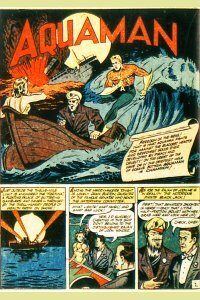 He enlists the man, who is never named, to help him with a disguise, and Aquaman goes aboard the gambling ship as a rich fool. This time Aquaman is knocked out with what appears to be a bottle. Instead of throwing him overboard, "No! Water is his life!" Black Jack tosses him in the furnace hold. This is the first hint that Aquaman is weaker out of the water and dry. Then again, any person tossed in a room with flames shooting out of a furnace as depicted would have trouble. Then again, water revived his strength enough to smash out of Dawn's prison. Finny Friends Report: Aquaman gets a sawfish to free the drowning man from the weights Black Jack's thugs put on him. Black Jack kidnapped Senator Burton's daughter, Dawn, because the Senator is the chair of the Waterways Committee, and he wants shipping privileges for his smuggling operations... When Aquaman asks if there is water, Dawn throws the water on Aquaman despite there being a fire right next to her as well. Either she's heard of Aquaman or it was clear somehow that's what he wanted... When undercover Aquaman flashes money, the goons let him win so they can get him to the office and rob him... The money Aquaman gives them is jewels from the ocean floor... Aquaman and Black Jack instantly recognize each other, even though Black Jack is still in costume... Aquaman looks distinguished in a tux... Black Jack kills one of his goons to get the last lifeboat, and plans to shoot Dawn as well before Aquaman stops him.